Israeli soldiers attacked, Friday, the weekly nonviolent procession against the illegal Israeli Annexation Wall and colonies, in Bil’in village, west of the central West Bank city of Ramallah. Palestinians, accompanied by Israeli and international peace activists, marched from the center of the village, heading towards the illegal Israeli Annexation Wall, separating the Palestinians from their lands, in Abu Lemon area. 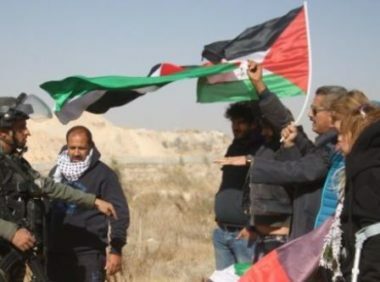 The Popular Committee against the Wall and Colonies in Bil’in, said the soldiers resorted to the excessive use of force against the nonviolent protesters, and fired gas bombs and concussion grenades at them. It added that the soldiers, stationed on military towers, took videos and pictures of the protesters. The Palestinians, Israel and international supporters, denounced the ongoing and escalating Israeli violations against the Palestinians and their lands, and called for the release of all detainees, held by Israel, the return of the refugees and the liberation of Palestine, as started by various international resolutions.